HospitalPORTAL > Healthcare Intranet Blog > Best Practices > Hospital Intranet Portal Governance – Why do you need it? Hospital Intranet Portal Governance – Why do you need it? An Intranet is a very special kind of computer system. Just like any other enterprise level software, it needs strong support from the internal IT team as well as from the vendor to ensure it runs optimally and without any hiccups or issues. At the same time a hospital Intranet, in its core, serves as an internal organization-wide communication platform for internal communication, knowledge sharing, document and policy access as well as administrative workflow automation within a hospital. Because these requirements are very different for each facility and they change over time, and also because multiple stakeholders and many different points of view need to be addressed, it is important that an internal oversight committee is formed to ensure the Intranet is continuously optimized for all of its end users. Being able to effectively manage all end users’ objectives in an ever changing environment that is often decentralized can be quite a task that calls for more than one person or department. In our experience – the most successful hospital Intranet implementations have one thing in common – an active portal governance team. While it is possible to implement an Intranet site without a governance team, it’s quite likely that a site that starts as a graphically pleasing and comprehensive system, will quickly turn into a collection of loose announcements and a clip art galleries that are difficult to manage or navigate, or a very sterile site that serves needs of a specific department only. An Intranet governance group on the other hand can ensure that everyone’s input is included and that the most critical and useful information is accessible on the front pages on the site or via a well-defined navigation system. Furthermore, a governance team on an ongoing basis will help to point out the Intranet’s shortcomings and drive continuous improvement initiatives. HOW SHOULD A GOVERNANCE TEAM BE STRUCTURED? Nursing and other clinical departments – because they are on the front line treating patients. Leadership/Administrative support – because they set the general direction for the hospital and are aware of new initiatives and goals, but also problems and key issues. Information Technology – because design decisions often need to be validated from technical feasibility perspective. Marketing/Employee Relations – because an Intranet is “the” internal marketing tool for the entire hospital staff and its affiliates. Human Resources – because an Intranet is an employee portal and employment related information is key information shared on the Intranet. Physicians – because at the end of the day, they are responsible for the course of patient treatment and they need the right tools to assist them with their core responsibilities. Policy Committee/Administrations – because each hospital has easily over 1,000 policies, procedures and other key documents in circulation. A hospital Intranet’s main feature is serving as a hub for all hospital policies and procedures. Support Services – because running a complex organization such as a hospital takes an army of people that are in non-clinical roles (facility, billing and finance, housekeeping, nutrition and food services, etc.). The above list is quite long, but this does not need to imply that a governance team needs to have a few dozen users or requires top level managers’ or VPs’ participation. The most effective Intranet governance teams that HospitalPORTAL has worked with had anywhere between 6-12 people representing the above departments and typically included an IT analyst or director, HR representative, administrative secretary to a C level executive, a marketing director or coordinator, and various clinical and support representatives. Furthermore, it’s OK and even encouraged to invite new people and rotate governance responsibilities over time. That way different points of view and ideas are introduced as the system matures and evolves. HOW OFTEN DOES A GOVERNANCE TEAM NEED TO MEET? Not often at all. It is sufficient for the governance team to meet once a month or every 2 months. It’s equally important that such meeting are well planned as it will be very easy to go off on a tangent. Our recommendation and best practice would be to ask all members to prepare their issues and suggestions prior to a meeting and have a clear agenda for what will need be discussed and reviewed. This may include a set of pages that need to be changed or created, a different navigation menu to a key resource, page or document, a new look and feel for the site, or a new component or functionality. Also, it is critical that decisions made at these meetings are clearly documented and a ‘to do’ list that includes responsible persons and due dates is agreed upon and distributed to all participants after each meeting. WHAT SHOULD THE PORTAL GOVERNANCE TEAM DECIDE ON? A governance group or a review committee that serves as a sounding board that represents interests of all stakeholders across the entire hospital simply makes sense. A hospital intranet governance team will not replace a strong owner or manager of the Intranet– a function that is critical to any long and ongoing project. Similarly, it is not a replacement for the IT department – as its support is necessary for any computer system. 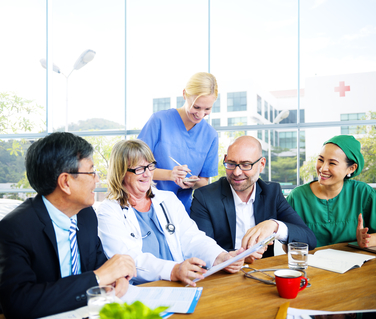 But a well formed governance group can truly make a huge difference in terms of how well your Intranet will address the unique needs faced by your specific hospital or healthcare organization.